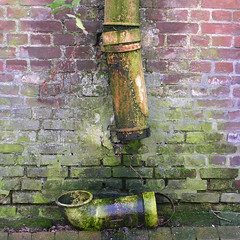 Cast iron, the traditional material for much of the rainwater goods in the UK, (although timber gutters were largely used in the north) has several drawbacks. It is very high in embodied energythe total amount of energy it takes to make a material (or a building). See more on embodied energy and needs regular maintenance and painting to prevent it rusting. Coated galvanised steel has traditionally been widely used in northern Europe and is environmentally somewhere in the middle; easily recyclable and not particularly high in embodied energy. However its endurance is not that great if the coating gets damaged. It then needs regular painting inside and out. Aluminium, copper and stainless steel all make high quality rainwater goods though they are all very high in embodied energy and tend to be polluting during manufacture. They all have very good recycling rates. Zinc rainwater goods are quite low in embodied energy, reasonably lightweight and and totally recyclable. Unfortunately they corrode fairly quickly and the run off is polluting to land and water. There appear to be no UK manufacturers for domestic systems although German and French suppliers have agents here. Wooden gutters have been in common use, particularly in the North of England for the last few hundred years. They are extremely low in embodied energy and are easily disposed of at the end of their life. They are also very sturdy and do not suffer the sort of damage that plastic gutters do from ladders being leaned against them. However, the quality of timber used has declined from being very high up till the middle of the 20th century (often high grade Baltic redwood) down to quite low quality now. Even when treated, water gets into knot holes and cracks and rots them relatively quickly. The practice of painting them internally with bituminous compound does little to extend their life as the bitumen flakes off in sunlight. However lining them with EPDMethylene-propylene-diene monomer. often used as a roofing membrane (or another single sheet roofing membrane works extremely well because it keeps them dry and contributes very little to embodied energy. It also obviates the need for the quite difficult lead joints at corners and the running joints. The only complication is having to fix top hats at outlets. This is not difficult once you have got your head round it. (most proprietary single sheet roofing systems have associated outlets and accessories which can be either heat welded or solvent welded). Timber gutters are very resistant to mechanical damage, eg. from ladders. They work very well with living roofsA roof with a covering of soil or growing medium and plants. They tend to be divided into turf roofs with a 150mm layer of soil and sedum roofs with a thinner layer (about 40mm). see Living Roofs because they are strong enough to be able to support the growing medium along the edge of the roof, especially if the gutter has a 65mm plastic land drain laid in it with a covering of pea gravel. This obviates any problems of leaves blocking the gutter. The Roof membrane can be run from the roof down over and into the gutter so that the gutter is fully protected. There is no reason timber gutters cannot achieve 100 years life time if they are lined. Although so much of the housebuilding market uses PVC guttering this is probably one of the less environmentally acceptable materials because of its embodied energy and the fact that it is so easily damaged (by ladders etc). It suffers from high thermal movement which can cause problems at joints if not installed very carefully. PVC is constantly having to be replaced because of damage and this further increases its effective embodied energy. PVC fall pipes tend to fair much better than gutters, partly because they are less susceptible to mechanical damage and they form much better joints than gutters. They can be reused if the joints are replaced (whereas this is much more difficult with gutter sections). There is the caveat that if PVC actually does get recycled efficiently (which is now possible – but seldom done) that it could be seen as a slightly greener material. GRP is particularly useful for valley gutters between sloping roofs. It lasts well, is easily installed, economical and not tempting to thieves (unlike lead). Harcon do some useful specs on thickness, fitting etc. There is a considerable amount of useful information on rain water goods in the Approved DocumentsApproved documents (England) are detailed publications which come under the English Building Regulations. They are based on tried and tested methods of building and if you follow them you are assured of complying with the Regs. The equivalents for Scotland are the Technical Handbook, for Wales: the Approved documents (Wales), and for N.I. the Technical Booklets part HThe Approved documents, (England) part H, deals with Drainage and waste disposal of the Building RegulationsThese are the mass of regulations that cover safety, health, welfare, convenience, energy efficiency etc. in the way buildings are constructed. Not to be confused with Planning consent (which is more to do with whether you can put up the building in the first place). See more on the regulations . See the sections covering Design rainfall intensities, Gutters, Rainwater pipes, Eaves drop systems etc.